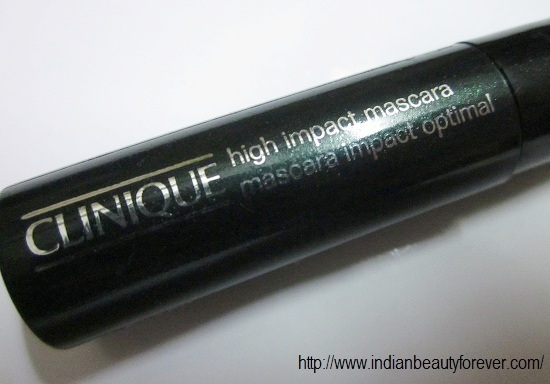 Today, I will review Clinique High Impact Mascara which I got as a sample in my first Vellvette box. I absolutely loved whatever I got in the first box. I love mascaras alot as they can instantly open up your eyes, in fact a lot of us do feel mascaras are "a must have beauty product" even if you are a minimalistic person. I was excited to try this mascara ever since I got it and now that I have used it a lot of times, mostly in the eye makeup looks so, it’s high time to review it. 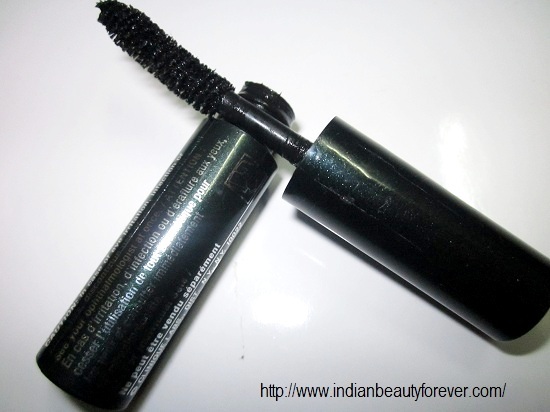 Price: This Clinique mascara comes for 1350 INR for 7 ml. This one is the sample size of 3.5 ml I guess. About the product: New richly pigmented shade gives eyes instant brightening power-it's clinically proven. Kicks up the volume and length of each and every lash for a look that's lusher, plusher, bolder. Pure, deep colour only adds to the impact. Wear it once and you'll feel naked without it. Ophthalmologist Tested. How to Use: Gently unscrew the wand (do not pump the wand to get more pigment on - that will only dry the mascara!) and then look a little down and gently run the wand on your lashes. Look up and repeat on the lower lashes. Experience: I was all excited to use this mascara and same happens when ever I get a new one. This Mascara comes in a regular black bottle with the details and brand name written in silver letters. 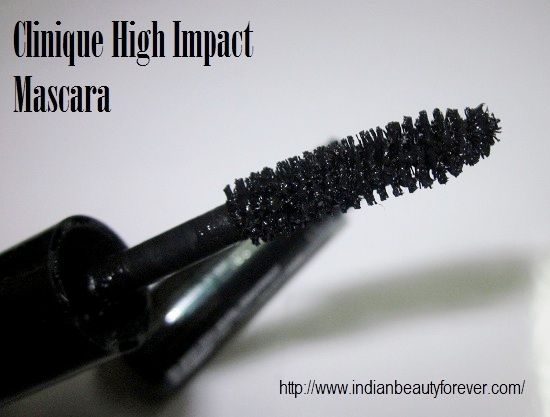 Wand has dense bristles reminds me of the wand of regular colossal mascara from Maybelline. It is straight not curved. The upper end is not much pointed so it makes using it on the tiny hair strands on the lower lash line a bit tricky. However, it does coats every upper lash strand perfectly and gives them length and thickness. Once it sets or dries you can feel your lashes are little stiff, sealed in with the product. It is water proof up to certain extent only. The curling effect that it gives when I use it remains for a pretty long time. Clumping is there though, not up to the extent that makes it too obvious. Here is the small demo: with and without. Wand is dense enough to coat each lash strand properly. Clumping is less and does not go worse with more coats. Wand is not tapered so coating the lower lash line hair is little difficult and you have to be careful. I would not spend that much on a mascara though.. Even though its a good product Ill never send that much on a mascara. My Rimmel and maybelline colossal zindabad! Same here dear, it does a good job but if we can get the same effects at one third the prices then it wont be wise enough to spend that much. Same pinch for Rimmel and Maybelline. they cost less and works fab!! Lol 1350 for a mascara!!! for 1 coat it looks nice but with 2-3 coats I can see rather than curling lashes become heavy, clumped and flat.. It does have a nice effect after several coats but for me I get that effect with my HG so I have no intentions of trying other! I do completely agree that maybelline makes pretty amazing mascaras that are far more affordable, thanks for sharing!